Historic England are holding a day-long course on Wednesday 11th May titled Human Remains in Commercial Archaeology: Legal, Ethical and Curatorial Considerations, which is to be held in Cambridge. As a massive bonus the event is free to attend. This re-run of the course, which was previously held in both Bristol and Manchester last year, sees it tackle the issues that surround every aspect of human remains within commercial archaeology. If that whets the taste buds the University of Huddersfield are holding a short course examining the methodologies used to age human skeletal remains titled Agestimation. The course, held at the Forensic Science department, runs from the Friday 13th May to Saturday the 14th May 2016. The two-day long sessions include lecture and practical elements to assess the theory and methodologies used in aging human skeletal remains. The short course costs £160.00 (£100.00 for students and staff at the University of Huddersfield) and includes 2 meals, however please be aware that the maximum number of participants is 30 so apply by the 9th of May 2016 to join the course. The course is aimed at the interested student or early stage researcher. I’ll put up more contact information here, and any page specific site, once further information has been released on this short course. Finally, here is a quick remainder of the upcoming 16th annual British Association of Biological Anthropology and Osteoarchaeology (BABAO), conference which is this year held at the University of Kent, near Canterbury, in September 2016. Registration is now open for participants to join and submit abstracts (200 words max,) for podium presentations and/or poster presentations from researchers involved with the fields of biological anthropology, osteoarchaeology and assorted allied areas. Please be aware that the deadline for abstracts is Friday 1st July. The conference itself runs from Friday 9th to the Sunday 11th September, and costs range from £175.00 to £115.00 unwaged although please do be aware that the price jumps to £180.00 for late bookings from July 14th. This is not a cheap conference by any means, although it does include the lovely meal and quiz. An association to join if you are involved with human remains in archaeology, forensic anthropology, bioanthropology or any of their allied disciplines. The four sessions at the BABAO conference cover the full range of biological anthropology and its related fields, with sessions focused on evolutionary perspectives on human behaviour, palaeoanthropology, and a session focused on bioarchaeology and forensic anthropology. For any abstracts outside of these disciplines topic wise there is also the normal open session. I can see that the guest speakers confirmed include Clark Spencer Larsen, from Ohio State University, a great researcher who has produced research and publications of great importance in bioarchaeology. I attended last year’s BABAO conference, which was held at the University of Sheffield, and I thoroughly enjoyed it; the quiz being a particular highlight! Unfortunately I won’t be able to go this year due to a holiday clash (I’ll hopefully be half a world away if my skeleton plays ball). If there are any other human osteology, or bioarchaeology, focused short courses coming up in the United Kingdom please do not hesitate to contact me and I’ll produce a new post. 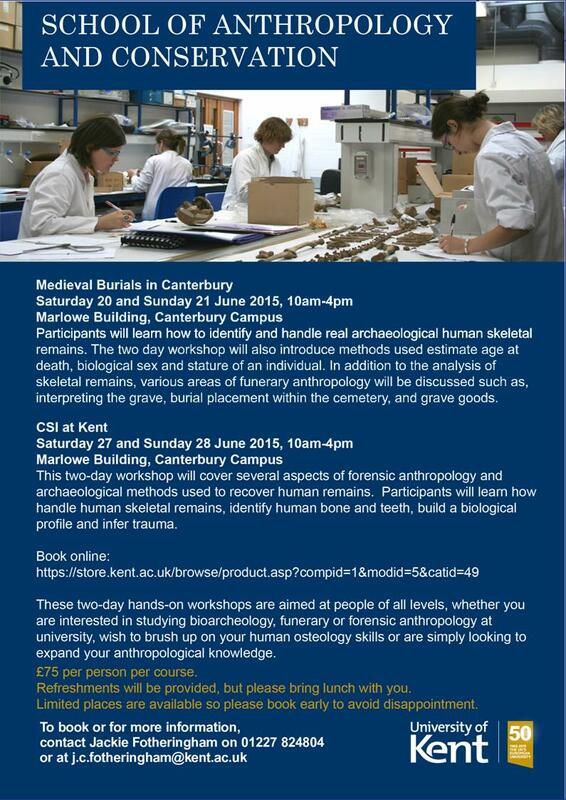 To apply and reserve a space for the Historic England-led Human Remains in Commercial Archaeology short course please see the Eventbrite page here. It is free to attend, but spaces are likely to go fairly fast due to intense demand. Check out the Facebook page for the Agestimation short course here. Please be aware that the deadline to apply for the course is 9th May 2016, so apply before this to secure a place. For more information on the annual BABAO conference, with further detail on the sessions and guest speakers, check out the University of Kent homepage here. The abstract submission form can be found here.